What does a warrior want in a boot? Everything. So we build the Desert TFX GTX to be breathable, cool, lightweight, waterproof, supportive, rugged, and a long list of other gutsy adjectives. 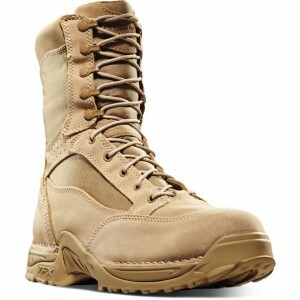 The Desert TFX GTX boot is lightweight and built for temperate sandy or dusty conditions. The GORETEX lining provides breathable, waterproof protection; the TERRA FORCE; X platform provides durable traction, heel-to-toe energy transfer and side support for maneuverability. A rough-out leather and 1000 Denier nylon upper enhance durability and the lightweight TFX outsole delivers improved acceleration and traction. When it comes to survival, one clothing item that is all too often overlooked is a good pair of boots. Not cheap boots, good boots. I’ve had my share of cheap boots, and I’ve had some high-end boots that were actually quite expensive. In my experience, a huge disparity between their quality exists. Cheap boots are typically not constructed from quality materials or put together with a high-level of tolerance. As a result, they usually don’t fit well or last very long. One that I’ve been wearing a lot lately is Danner’s Desert TFX duty-ready military boot. Danner pride themselves on their high quality boots for both men and women. Their name is synonymous with top quality craftsmanship, attention to detail, comfort and durability. Everything that you find in every boot they sell, including their imported models. The Desert TFX military boot provides a sleek, low volume athletic profile with ample toe room, loads of support and exceptional comfort. The mojave colored upper was designed specifically for hot weather conditions from a combination of rough-out full-grain leather and 1000 Denier nylon for superior durability, breathability, and resistance to the elements. The upper features a GORE-TEX® liner that is both breathable and 100% waterproof. The GORE-TEX lining was engineered to keep your feet dry and comfortable, even under the most extreme conditions. The Desert TFX military boot is also available with 400 gram Thinsulate for those requiring additional protection under cold conditions. The TERRA FORCE® X (TFX) platform is a patented lightweight and durable midsole/shank system with a sturdy self-cleaning traction outsole for outstanding heel-to-toe energy transfer, side support for enhanced maneuverability, and protection from arch overwork and fatigue. This translates to improved acceleration, downhill braking, and side hill traction. Perfect for temperate urban and rural combat and survival scenarios. The Desert TFX military boot also features a speed lace system for a quick, secure fit, and beveled lugs which prevent debris build-up. The boot utilizes non-magnetic metal hardware for increased durability. From that first moment when I tried Danner’s Desert TFX boots, they have provided exceptional comfort and protection, requiring no break-in whatsoever. I’ve walked in them, ran in them, and spent hundreds of hours wearing them around job sites. Whether I was digging trenches, climbing ladders, kneeling or crawling around in confined crawlspaces, not once have I experienced any fatigue or come across a single hotspot. As to the condition of the boots, they have performed exceptionally well at standing up to the elements and all of the abuse that I had put them through. Aside from some minor tread wear and a few scuff marks here and there, they look like they are barely used. Much better than I could have ever imagined. Whether you are trekking through the desert, or pulling a double shift at a construction site, you need a pair of quality footwear, and these boots won’t let you down. The craftsmanship, quality materials and attention to detail that Danner provides in their Desert TFX boot directly correlates to its attractive athletic-styling, phenomenal comfort and exceptional durability. Danner’s Desert TFX boots require no break-in period so you can hit the ground running. They are very lightweight and easily comfortable enough to wear them day in and day out, without fear of hotspots or fatigue from the moment you put them on. While they are not the only game in town, they are certainly high up on the list. Two thumbs up!